Israeli forces have entered the West Bank town of Ramallah, sparking clashes with Palestinian militants that have left four people dead and 20 hurt. Israeli military vehicles and bulldozers blocked off streets near the central Manara Square and a helicopter is reported to have opened fire. Gunfire and explosions were heard in the area. 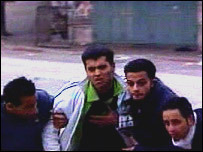 An Israeli spokeswoman said that four wanted Palestinian men had been held. The Associated Press news agency quoted a Palestinian security official as saying the target of the Israeli raid was a leading militant from the al-Aqsa Martyrs' Brigade. That armed group is linked to the Fatah party of Palestinian Authority leader Mahmoud Abbas. Ramallah, the West Bank's second largest town, houses the headquarters of the Palestinian Authority. Television images showed men throwing stones at the Israeli vehicles as they cleared a path through the streets of Ramallah. Ambulances took away the injured. Hospital sources in Ramallah confirmed that four people had been killed in the Israeli raid, that lasted for roughly an hour. As dusk fell and the Israeli vehicles left Ramallah, hundreds of Palestinians took to the streets, chanting slogans. Israel agreed to a truce with Palestinian militants in Gaza in November but sporadic clashes have continued in the West Bank. Israeli Prime Minister Ehud Olmert apologized for the civilian casualties in the latest raid, after talks with Egyptian President Hosni Mubarak in Sharm el-Sheik. The BBC's Bethany Bell in Jerusalem says many Palestinians will regard the raid as a very public display of Israeli strength at the time of the summit. Israel described the operation - the biggest incursion into Ramallah since May - as "routine". Palestinian negotiator Saeb Erekat said Israel's action was "undermining" peace efforts. 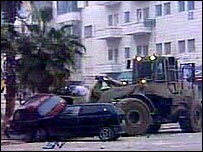 He accused Israel of bringing "destruction and havoc" to Ramallah.